I haven't done one of these posts in a long time, but since my trip to Boston was cancelled due to TWO FEET OF SNOW they were getting, I'm home, and I need something to do. Here it goes. 1. This image by Charles M. Schulz which was sent to me by a coworker. It's true. Said by character, Frieda. Other choice quotes said by this character: "People hate cats. People hate people who own cats. And people especially hate people with naturally curly hair who own cats!" and "What's the good of having naturally curly hair if nobody's jealous?!?" What's the good indeed, Frieda. 2. 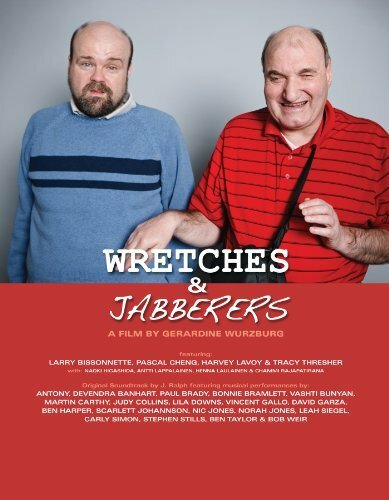 "Wretches & Jabberers" documentary following two men who have autism. This film is so awesome. I cried, I laughed, I wished I was as cool as them--you get what I'm putting down. Seriously, watch it. It's on Amazon Instant and Netflix. Such beautiful souls. 3. Lisa O'Connor's Vinyasa Flow class at A Perfect Knot on Thursday evening. I was struggling for a quite some time to find a yoga teacher that best suited me here in Madison. I deeply missed my Chicago yoga teachers. I went to Lisa's class for the first time two weeks ago, and I was hooked. She has a dance background (like me, though hers is much more advanced, I'm sure), and this shines through in her yoga instructor. It's seriously like no other yoga class I've ever experienced. It combines by love for dance and yoga. It makes me feel home again--as cheesy as that sounds. Olive Grrrls: Italian North American Women and the Search for Identity is a book I've been waiting for. It is a visionary call to reclaim all of who we are as Italian North American women, in all our complexity. I can't wait to pass it on to my own multiracial Italian North American daughter. She's the next generation of Olive Grrrl. 5. My new life motto: "Think critically or die tryin'." What have you been reading, writing, seeing this past week? Any favorites you'd like to share?